Adults who enjoy being musicians by and large were enthusiastic about studying their instrument as children. They may not stay with the instrument they started on – how many bassoonists started with the clarinet, or percussionists with the piano? – but for the most part it was exciting to start the process of learning how to play. For every confirmed instrumentalist, however, there are a multiple of dropouts. This is a major reason why parents are hesitant to invest in a musical instrument, at least in the beginning stages of study. When it comes to violins that is even more the case because violins come in seven graduated sizes, starting with the 1/32 size to full size, the 4/4. This is a practical necessity of playing, as the size of the instrument has to be easy and comfortable for the musician. Still, even those student size violins can be costly. As with children’s clothing, they will outgrow it in a year or two. Cello, viola and violin rentals are usually available at most local violin shops, which also provide instrument sales for students and beginners. If the beginning player is a child, it probably makes sense to rent, particularly if the violinist-to-be is not yet committed to the instrument. Rental violins are typically used instruments maintained by the local violin shop. 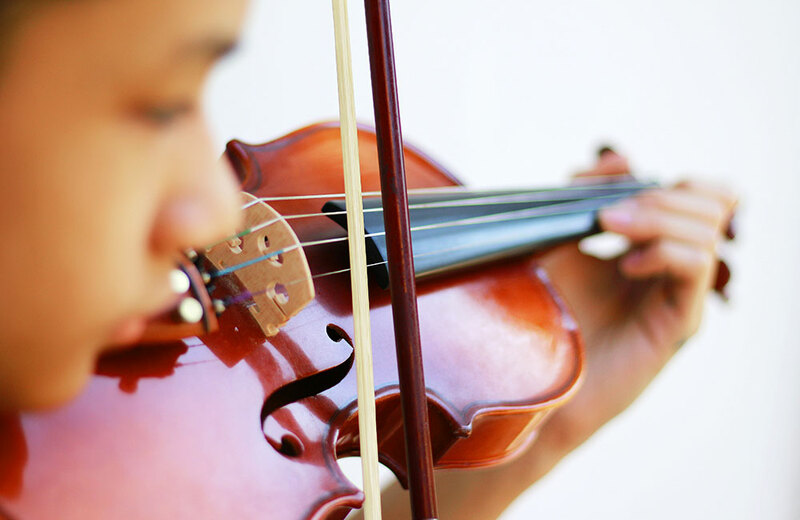 Enlist a professional – either a local violinmaker or the child’s teacher – in choosing an instrument that will inspire the student to enjoy study, practice, and performing. It’s important to note, however, that higher quality instruments – those crafted with higher quality wood and fitted with better accessories – sound better and are easier to play than cheaper instruments. For a young violinist, then, once his or her commitment to the violin is confirmed, it makes better sense to invest in a better sounding, higher quality violin. Though some violin shops may encourage parents to “rent through the sizes,” it may not make financial sense to do so. In many cases the cost of purchasing can be at about at par with the cost of renting for about a year. Even smaller-than-full-sized violins hold their value and those parents that purchase smaller violins for their growing and developing player have the option of trading in smaller violins for larger violins, lesser quality violins for more fine instruments. This is a time, after all, when a love for music and playing can be very strong for the student who has proven they have the discipline, talent, and heart for it. Therefore, it’s a time to get serious about committing to an instrument as well. It needn’t be a new instrument. In many cases, used instruments properly set up by the shop, can sound excellent and come with an excellent price tag. Experts will tell you that there is a psychological advantage of purchasing an instrument for a child rather than renting one. A student who owns his or her own violin, viola or cello is more likely to practice and take lessons and commit to study long-term knowing the instrument is their very own. Let us never forget, an instrument may take the player to college and beyond, or simply be the instrument they will cherish the rest of their lives in playing for special occasions, holidays, and friends. How much the instrumentalist and their family will or should pay for the instrument is a function of the degree of commitment and available resources. There is certainly a point when the price-value of a violin to the student becomes clearer. The promising violinist may need to spend several thousands of dollars for the violin that matches his or her ability and ambitions. 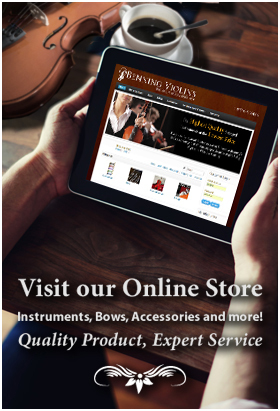 Before buying, do some talking: to teachers, to luthiers, and to other violinists. They may be able to offer good advice – and perhaps a lead on what you can afford or a violin financing plan that fits your budget.